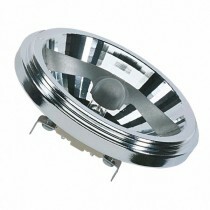 Osram Halospot AR111 ECO lamps are energy saving replacements for traditional halogen 12v AR111 reflector spots. AR111 IRC lamps offer a 30% energy saving when replacing regular halogen AR111 lamps. Osram AR111 IRC lamps are direct replacements for regular halogen AR111 lamps, meaning there is no need to replace or change the transformer. Osram AR111 ECO lamps use IRC technology which enables a lower wattage lamp to be used with no loss of light output. Its easy really, IRC = Infra Red Coating, the coating covers the capsule or burner insulating the lamp. For the lamp to operate at its optimum it needs to be at a specific temperature. As the lamp is insulated the power required to reach this temperature is now reduced, which is why a lower wattage can be used to achieve the same power output. Which Osram Halospot AR111 IRC should I use?